Upgrading to fiber for business Internet service can offer benefits to your organization such as productivity gains, greater reliability, and superior speed. When compared to traditional copper or coax cable Internet access technology, fiber offers significant advantages in areas such as bandwidth, upload and download speeds, security and long-term costs of ownership. As many fiber providers expand their resources in major cities, fiber Internet availability is more expansive than ever before. The costs of connecting your business to fiber can vary significantly, and an upgrade can be very expensive if your building is not already connected to fiber resources in your city. There can be a great deal of confusion around the question of the exact cost of upgrading to fiber, and the answer is that it depends. The most significant factor that impacts the cost of switching to fiber is whether your building is already lit with fiber, or are there fiber resources nearby. If you’re wondering how much it will cost your business to upgrade to fiber Internet and whether your building is already lit with fiber, you’re in the right place. In the paragraphs ahead, you’ll learn why being in a fiber-lit building matters and how to tell your proximity to fiber resources. What is a Fiber-Lit Building? A fiber-lit building is a building with fiber facilities physically installed into the building and connected to a fiber provider’s network. A building is not fiber-lit if the fiber only reaches a pole or underground handhold outside. As a business, being in a fiber-lit building makes a significant difference when it comes to upgrading to fiber Internet quickly, and at the lowest cost possible. Upgrading to fiber is faster, easier, and cheaper if you’re in a fiber-lit building already. If your business is in the process of moving and you’re considering making the switch to fiber-optic Internet service, it may be worth your time to consider whether future business locations are fiber-lit. If your building is already lit, your business won’t need to absorb the costs of construction and permits to pull fiber into the building and upgrade to fiber-optic Internet connectivity. While these costs are sometimes split between landlords, the carrier, and building tenants, the costs of lighting a building for the first time can be significant. Permitting can vary by jurisdiction and construction costs can vary as well. Historic buildings pose problems. Construction that must cross a sidewalk or streetscape will cost more than going through soil. Even with a highly-responsive carrier, there can be significant wait times associated with lighting a building for the first time. This can be due to factors such as bureaucracy, complexity of construction, as well as distance and proximity to unusual features such as a railroad, subway or river/water feature. Depending on your building’s location, physical barriers to installation, and other factors discussed in-depth later in this post, you may need to obtain a significant number of construction permits and get quite a few contracts signed. All of this can contribute to lengthy wait times for a lightning-fast, high-bandwidth Internet connection. If your building is already lit for fiber, you’re at a significant advantage. You and your provider don’t have to navigate through the installation process to connect your business to fiber resources. But how do you know if your building is already lit for fiber, or how close your building is located to existing fiber resources? Determining whether your building is currently lit for fiber requires identifying the major fiber providers in your area, and using their online and telephone customer service resources to see if they have already completed an installation. You can also use a resource such as FiberLocator. You may also be able to conveniently ask your landlord about existing fiber resources in your building. Most major fiber carriers offer online maps that detail proximity to your building, which can provide instant insight into whether your building is fiber-lit. If you know which fiber providers cover the ring in your city, you can drill-down to check a few websites and determine proximity in a few minutes. 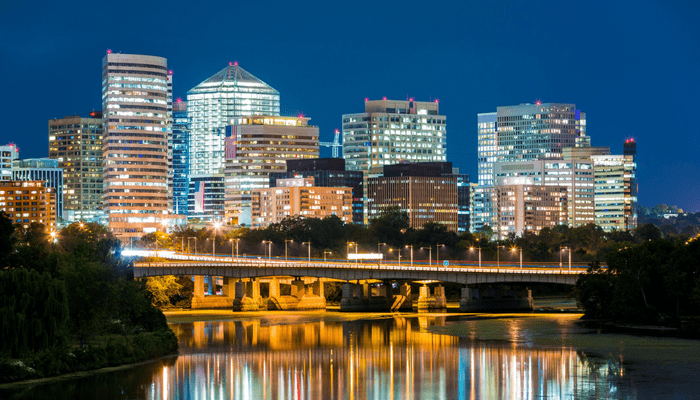 If you’re a business located in the Washington DC Metro area, Atlantech Online is a leading source for exceptional fiber Internet connectivity for business and government for over 20,000 commercial buildings in Virginia, Maryland, and the greater DC Metro area. Click here to check for fiber Internet availability now. What are My Options if My Building isn’t Lit for Fiber? If you discover your building isn’t currently lit for fiber, the costs of installing fiber service can vary significantly. Unfortunately, the cost factors can vary significantly depending on a number of variables. How close is the nearest fiber ring? The proximity of fiber resources to your building is likely the single biggest factor in overall cost of installation. If the fiber stops outside your building, overall costs are likely to be much lower than if the fiber is located a mile or more away. What kind of an existing conduit does your building have? If a fiber installation can take advantage of an existing conduit, it can make the installation simpler and keep costs down. The placement of fiber cable will impact overall costs of lighting the building. If fiber resources will need to cross significant physical obstacles, such as a highway or railroad, to light your building, it could result in a higher-cost installation. Are There Many Layers of Bureaucracy? Before you can light your building, you’ll need to obtain the necessary permits. For businesses in Washington, D.C. and other metro areas where construction is highly-regulated, the cost of permitting alone can be expensive. Do You Have Sufficient On-Site Resources? During your on-site evaluation, you’ll evaluate the telco closets to ensure there’s sufficient space to support fiber. If your building telco closets are already full, this could mean additional construction costs to get your building lit with fiber. Do You Have the Power to Light Fiber? Within your telco room, is there ample power and, ideally, an emergency generator available to activate service? If the answer is no, there could be some additional cost associated with bringing on the necessary power capabilities for fiber. Having access to generator power is desirable if you're also delivering phone service over your connectivity. You want to be able to dial 911 in the event of an emergency. How Large is Your Building? It is typically costlier to light larger facilities and buildings with fiber resources than smaller facilities. For more in-depth insights, we recommend: How Much Does it Cost to Get Fiber Internet Installed in My Building? While these factors are generally universally-applicable, the only way to determine your building’s individual cost factors of being lit for fiber is to undergo an on-site evaluation. Unfortunately, there’s no simple, universal price tag associated with the cost of upgrading a business to fiber-optic Internet service. The cost can vary significantly, but the single biggest variable is whether the organization is located in a building which is already fiber-lit. If the answer to this question is yes, the upgrade is likely to be relatively low-cost and simple. If not, the cost and timeline can vary significantly, depending on factors such as proximity of existing resources, permits, physical obstacles, facilities layout, and more. Atlantech Online provides top-notch fiber Internet on our own network to business customers in the greater Washington DC Metro Area--including unmatched customer support and 24/7 proactive network monitoring. Click here to learn if your building is fiber-lit.